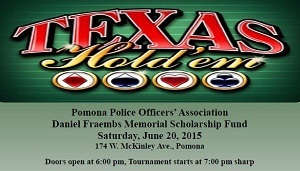 The Pomona Police Officers' Association is hosting a poker tournament on Saturday June 20, 2015 at the PPOA office. The tournament is a fundraiser for the Daniel Fraembs Memorial Scholarship Fund. Everyone from novice to O'Malley is welcome to play, so feel free to invite friends, family, etc. Space is limited, and you get a better bang for your buck if you buy pre-sale. Contact any PPOA board member for pre-sale tickets. See the attached flyer for further.